What sort of unhappily ever after is in store for Peter Quill and the Guardians of the Galaxy? The debut issue of Old Man Quill wastes no time in answering that question. The busy first act introduces us to a Quill who stuck with the Emperor of Spartax gig, and even before things start going wrong, there's a hint of bitterness to him. He's alone, by choice, but the distance established between him and his heroic pals still hurts. Anyway, the Universal Church of Truth is coming to burn Spartax down. Quill bets big on stopping them in a heroic space battle. This being the "how everything went wrong" section of an "Old Man" story, he loses big, of course. The Guardians roll up many years later to collect a drunken, much more bitter Quill from the ruins of Spartax. They waste no time shuffling him into a vague "save the galaxy" caper. This is the point where the story unravels. Hints that the Guardians have their own pressing problems with the UCT are shared and then shelved. The last act hooks a hard left turn and points the heroes in a direction that's a little surprising and not at all welcome. The plot is rather ramshackle so far. How about the characterization? There's good news and bad news. The good news is that the artist put a lot of rewarding effort into old-ify-ing Peter Quill and the Guardians. They look appropriately high-mileage and a lot of appreciable effort went into detailing their costumes. The colours accompanying the art may seem initially disappointing. This palette obeys the rule that a Bad Future must have a desaturated, low-intensity colour scheme. Though the colours are rarely vibrant, they still have rich textures and make a huge contribution to the visuals. A great deal of the art's depth and weight comes directly from the careful modulation of the colours. 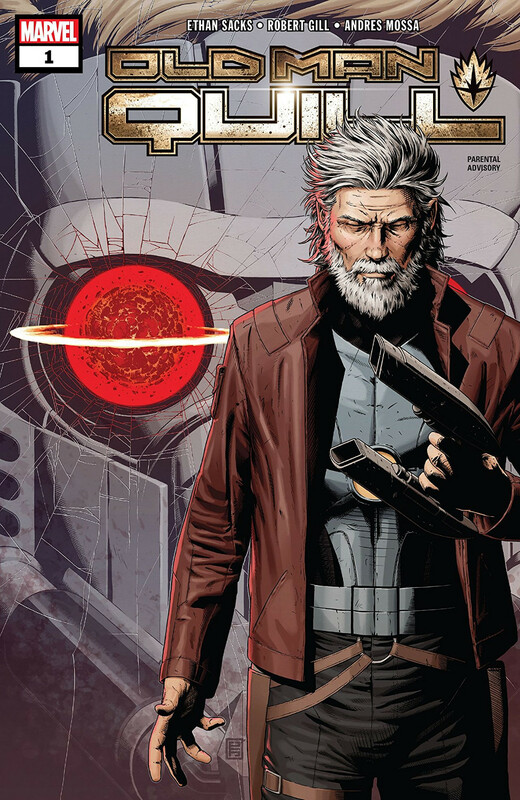 On the script side of things, Old Man Quill #1 is rather less impressive. Quill gets a protagonist-worthy amount of character exploration. His teammates are less fortunate, making do with scraps of cute dialogue designed to amuse first and inform second, if at all. Mantis, in particular, is poorly served by the lack of focus. The aimlessness of her visions hint at a mind unravelling under the strain of years. This is dimly portrayed through a pastiche of flat, unexpressive dialogue. The speed of the plot also hurts her teammates' reactions to her; the other Guardians come off as callous or simply ignorant of her obvious struggle. I've already developed a love/hate relationship with Old Raccoon Rocket.